The heat transfer plates are thin sheets of corrosion resistant metals such as stainless steel or titanium and etc. that are press-formed with a corrugated pattern on their surfaces, and sealed with synthetic rubber gaskets in their groove, which seal the flow channel and direct the fluid into alternate channels. Such plates are suspended, supported and aligned by guide bars, and tightened by bolts and nuts between fixed and movable frame. The equipped can adjust the number of plates so as to meet the heat duty. Each heat transfer plate is corrugated to various patterns to increase its strength and heat transfer area. Furthermore, the corrugation creates high turbulence and thereby achieve high heat transfer coefficient. The plate is provided with passage hole on each corner. 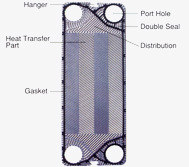 Each plate is tight-sealed with a gasket fitted in its peripheral groove. The plates are divided into A-plate and B-plate, and a passage is formed between these plates. The high temperature fluid flows alternately and in the opposite direction of the other fluid. 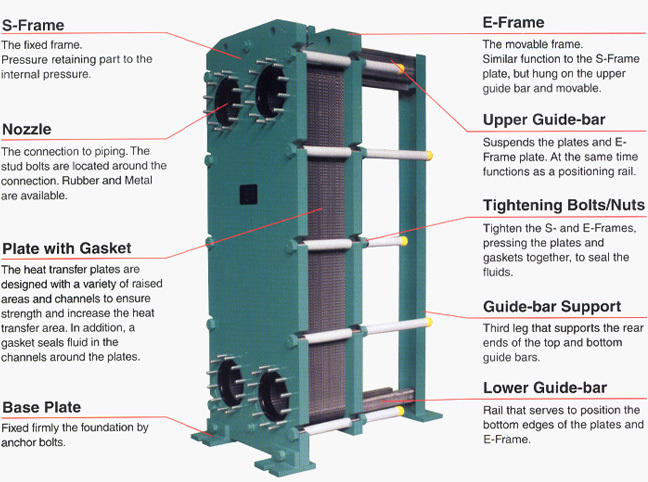 Thus high efficient transfer of heat is achieved through these plates. A-plate when reversed would become B-plate. As such only one type of plate cab be used as A-plate and B-plate for most models. With single- pass design, all of the connections are made on the fixed frame side only. This simplifies piping work and increases layout flexibility. With a multi-pass design, connections are located on both the S-frame (fixed-frame) and E-frame (movable-frame) sides making it necessary to remove and adjust the piping.